Google, in its continuing quest to take over the World, is entering the field of legal research. At a subpage of Google scholar, you can research cases by name or by citation. A search for Hermansen v. Tasulis pulled up 39 hits in .05 seconds; unbelievably faster than the alternatives, and presumably more thorough. The hits include the opinion itself; cases following the opinion and articles and briefs related to the opinion. A search for “Lincoln W. Hobbs” pulled up 16 reported opinions in which I’ve been involved, several of which I had forgotten. A rather handy research option for clients and counsel. The jury’s still out (sorry) on how valuable this will be, but I’ll be looking into it over the next while. 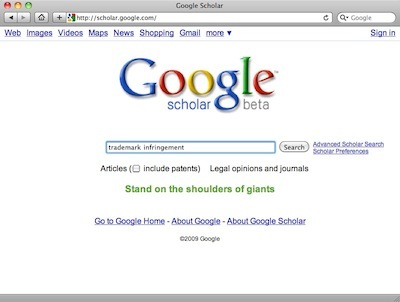 To use the new resource, go to http://www.scholar.google.com, click on the legal opinions and journal option and type your query.